After I fetched my bike at the Bowmore Post office, I biked the 13 miles (20km) between Bowmore and Lagavulin under a light drizzle and I just arrived on time for the 12.30 tour. When I arrived at the distillery I was surprised to see that the parkings were full and the queue started in front of the stairs leading to the reception. When you are used to a maximum of 10-15 people for a tour during the regular summer period and you discover that at least 80 person are waiting, you know you are at Lagavulin during the Feis Ile! My last visit was in 2004 during the silent period, so I was happy to smell the nice atmosphere and flavours of Lagavulin again. 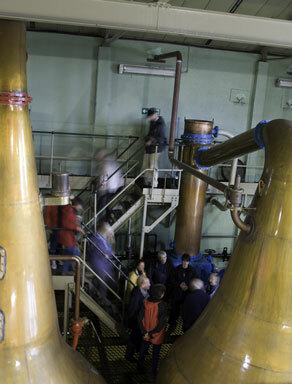 The Stills of Lagavulin with their famous steep-angles Lyne arms surrounded by a continuous flow of tourists Angus the Stillman is working very hard. I had a nice talk with him and in 10 years I will check in 10 years is assumption with the quality of the "new millennium" Lagavulin! It is always a pleasure to spend some time in the still house, to have a look at the open condenser at the end of the steep angled Lyne arms. 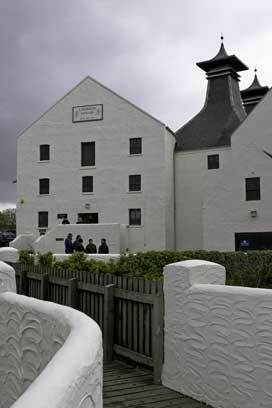 I had a nice conversation there with David Wishart, the author of "Whisky Classified" and Angus, the stillman. As you might now, it is now hard to find bottle of the Lagavulin 16 YO, while In the mid 80s, the whisky market was quite "morose" and whisky was distilled only 3 days per week. 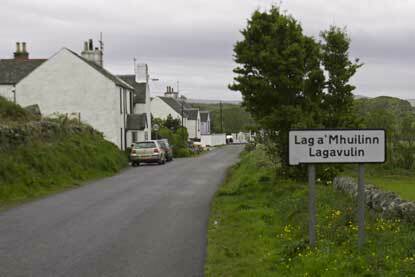 During this period, they also ran for a while only one wash and one spirit still, which led to the loss of the Lagavulin character. 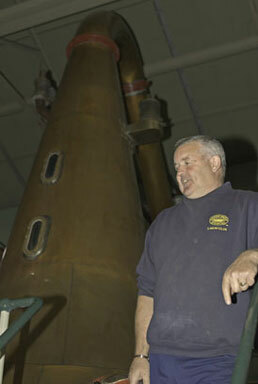 Although the two spirit stills looks similar, their shapes are slightly different, like the height of their shoulders. This is also the case for the wash stills. These minor differences have a significant impact on the final product. I ended the tour with the degustation of the 12 YO and 16 YO Lagavulin. Although I enjoy the complexity of the voluptuous and rounded 16 YO, I personally prefer the 12 YO. Its youth make it fresh and clean, but also adds some notes of fresh grass. I like it at cask strength, but adding some water will reveal some additional fruitiness. I would be very interested in once trying a 16 YO cask strength and to compare it with the regular bottling. When it comes to the taste of Lagavulin, Angus told me that the best way to drink the Lagavulin is to drink it very cold. I will definitely try it, because I did a similar experience with an almost frozen Dalwhinie served with a nice chocolate mousse. The flavours were progressively released and it was a pure pleasure. The same thing is true with cheese cake and cold-served Longrow sherrywood. I spent an additional 2 hours walking around the distillery to complete my collection of whisky photographs and managed to gone home dry. That was a good start! There is no doubts that Lagavulin is one of the best scotch whiskies and I heard that the quality of the spirit maturing since the new millennium will be even better. If this spirit is as nice as Donald Renwick (the distillery Manager) and his team, we will have a beautiful surprise in a few years. 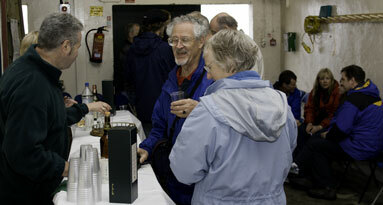 I think everyone appreciated their dram after the tour !